Here’s a “smooth” way to kick off the New Year, with a healthy you! Smoothies can be a fantastic meal replacement when created thoughtfully: they should be satisfying, well-composed and (of course) super-scrumptious. 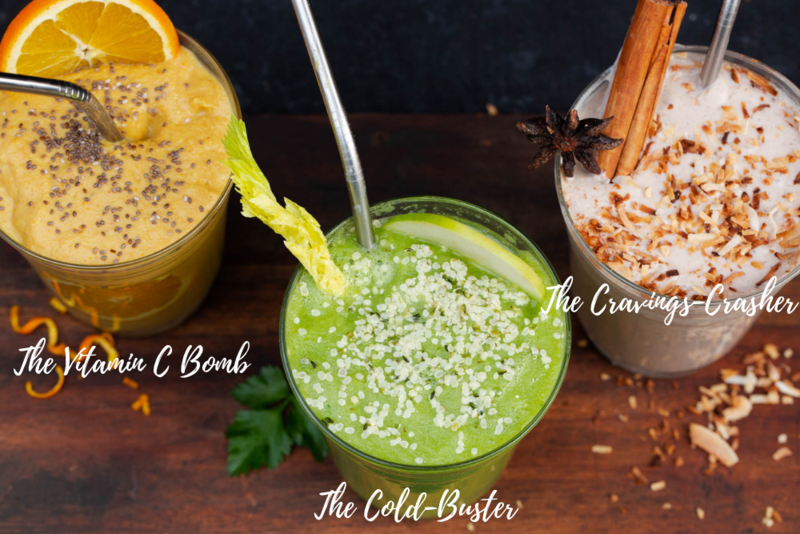 Here’s a smoothie trifecta for you: choose one or make all 3! We call this smoothie “The Cold-Buster.” If you’re feeling like you need a pick-me-up, here it is in a glass! Pop all your ingredients in your Vitamix, and add about 1 cup of water to start. Blend, using the tamper, to a nice consistency (add more water if you need to.) Taste, and adjust the sweetness (apple), spiciness (ginger) and sour (lemon) to taste. Although celery is known to have sodium, it is also super-nice to add a sprinkling of sea salt. 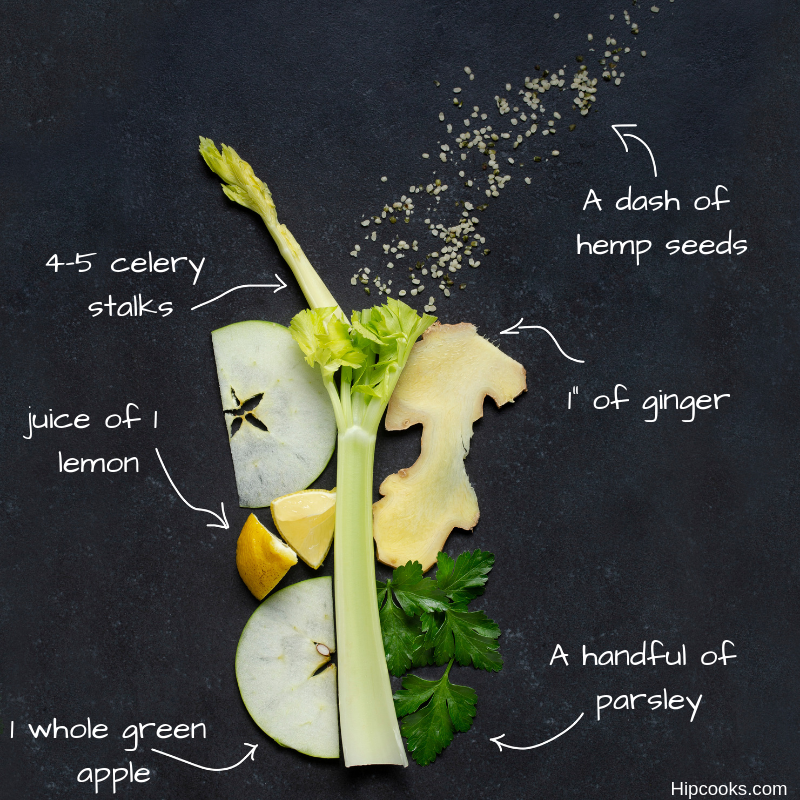 Because we love to garnish the smoothie, we add hemp to the top. Also, it is satisfying to “chew” on a sip…it makes us feel like we’re having a meal. If you like a “smooth smoothie,” then leave them out. We call this smoothie “The Vitamin C Bomb.” If you’re feeling like you need an inoculation of good health, here it is in a glass! Pop all your ingredients in your Vitamix, and add about 1 cup of water to start. Blend, using the tamper, to a nice consistency (add more water if you need to.) Taste, and adjust the sweetness (fig), richness (coconut oil) and sour (lemon) to taste. Because we love to garnish the smoothie, we add chia seeds to the top. Also, it is satisfying to “chew” on a sip…it makes us feel like we’re having a meal. If you like a “smooth smoothie,” then leave them out. Rich with healthy fats, protein and warming spices, this satisfying smoothie will knock your cravings outta the park! Add the nut milk, dates, and fresh ginger to the Vitamix. Blend, using the tamper, to a nice consistency and add the spices. Taste, and adjust the sweetness (dates) and richness (add some coconut oil for extra creaminess). Is it cold outside, or are you needing something warm? The lovely thing about the Vitamix is that you can blend on high speed for a few minutes, and the friction of the blades will warm the drink. Lovely, warm, frothy lusciousness — yes, please! Wanna take this over the top (and add a hint of sweetness without sugar)? Then sprinkle toasted coconut flakes on top. You’ll be glad you did! 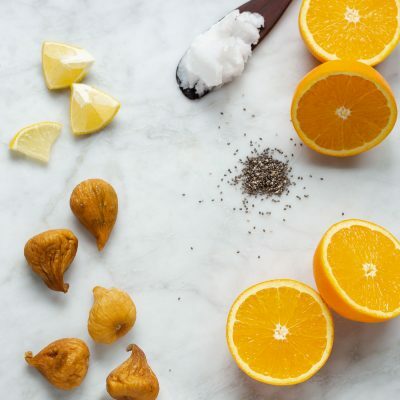 I just made the fig and orange shake – so so good! I feel like doing cartwheel laps from front yard to back!